An export from Moves shows my motion throughout the day of April 3, 2013. In February I installed Moves, a free app that uses your location and movement to create a daily storyline. 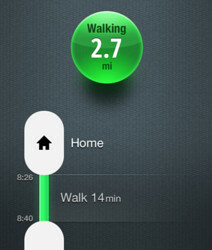 It's sort of a pedometer-plus, counting steps but also mapping locations and tracks throughout the day. I'm blessed to be able to walk to work most days, so most of the steps that Moves ends up tracking are on the 0.6 mile trek between our house and Emcien. That walk is pretty short, but includes a steep climb. Because of that, my walking speed is noticeably faster coming home from work than it is heading in: approximately 0.3 - 0.5mph different, according to Moves. Even more noticeable is the difference in steps. Each day I take approximately 1300 steps on the way into the office, and 1100 steps on the way back. I'm covering about 15% more ground with each step coming down the hill. I guess it makes sense, then, that I keep having to tell Moves that I wasn't running. Given the difference, it's a fairly understandable mistake.